This post is being republished after appearing at FanGraphs earlier this month — as it seems particularly relevant given the lack of a new CBA ahead of the December 1 expiration of the current one. In two weeks time, on December 1st, the existing collective bargaining agreement (CBA) between Major League Baseball and the Major League Baseball Players Association is set to expire. While the two sides have been working for the better part of a year on negotiating a new agreement, to date they have not yet been able to come to terms on a new CBA. Based on existing media reports, it appears that the hold-up over the new agreement centers around two primary issues: raising the luxury-tax threshold and creating an international draft. Both topics were expected to be among the most important — and thus potentially contentious — issues discussed during the CBA negotiations. So the fact that the parties have not yet reached an agreement on either point is not particularly surprising. Still, with only two weeks left until the old CBA expires, some are beginning to speculate about whether a potential work stoppage could be looming on the horizon. That, in turn, raises questions regarding the potential legal ramifications of the two sides failing to agree to a new CBA before December 1st. For the last three years, the overwhelming majority of baseball fans in Los Angeles have been unable to watch the Dodgers play on television. In 2014, the team partnered with cable provider Time Warner to launch SportsNet LA, a network dedicated to the franchise. Citing the excessive price that Time Warner was demanding from other cable providers for the rights to air SportsNet LA — such as an initial asking price of roughly $5 per subscriber per month — other service providers like AT&T, DirecTV, and Cox have subsequently refused to carry the network. As a result, since 2014, upwards of 70% of Los Angeles residents have not had access to televised Dodgers games. Indeed, because Time Warner only offers cable services in parts of the Los Angeles metropolitan area, in many cases even if fans were willing to change cable providers to gain access to the Dodgers, they were nevertheless still unable to do so because none of the available providers in their neighborhood carried SportsNet LA. Given its high asking price for the network, it’s not surprising that the public has typically painted Time Warner as the bad guy throughout this ordeal. According to a lawsuit filed last week by the U.S. Department of Justice, however, Los Angeles sports fans’ anger may have been misdirected, as it now appears that DirecTV — now owed by AT&T — may in fact be largely to blame for the Dodgers’ three-year blackout across much of Los Angeles. If Canadian indigenous-rights activist Douglas Cardinal had had his way, the Cleveland Indians would have been legally prohibited from playing Games 3 through 5 of the American League Championship Series in their standard road uniforms. According to a lawsuit filed by Cardinal on Friday in Ontario Superior Court, both Cleveland’s Chief Wahoo mascot as well as the “Indians” team name itself are racially offensive and discriminatory, in violation of Canada’s Human Rights Act (which generally prohibits businesses from “differentiat[ing] adversely” between citizens on the basis of race, gender, religion, or sexual orientation). Although Judge Thomas McEwen announced on Monday afternoon that he would not be issuing an injunction blocking Cleveland from wearing its normal uniforms during the ALCS, the legal proceedings have nevertheless brought renewed attention to Cleveland’s use of what are, in the minds of many, racially insensitive team insignias. This raises the question of whether Cleveland’s — or, for that matter, the Atlanta Braves’ — team name or logos are at risk of being successfully contested in the United States. Indeed, considering that a U.S. federal court ruled last year that several trademarks belonging to the National Football League’s Washington Redskins must be cancelled due to their disparaging nature, it is entirely possible — and perhaps even probable — that Cleveland or Atlanta could soon face a trademark challenge of its own in U.S. federal court. 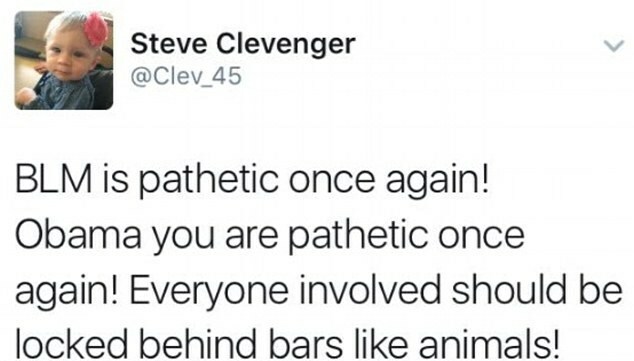 Not surprisingly, the public response to Clevenger’s comments was swift and unforgiving. Within hours, the Mariners released an official statement distancing the team from the remarks. And although Clevenger later apologized for the tweets, the Mariners nevertheless announced on Friday that the team was suspending him without pay for the remainder of the season. On the one hand, the impact of the suspension on Clevenger will be relatively modest, as he was already on the 60-day disabled list with a broken hand, and thus was unlikely to play again for the Mariners this season. 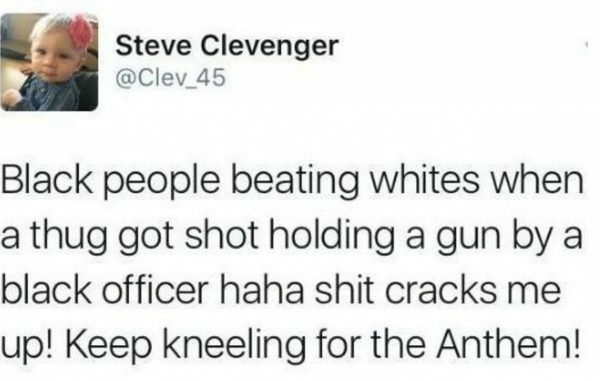 On the other hand, however, by being suspended without pay, Clevenger will forfeit the roughly $32,000 he would have earned over the season’s final 10 games. It does not appear as though Clevenger will challenge his punishment, according to a report by Maury Brown. If Clevenger were to change his mind and file an appeal, however, then it is possible that he could get his suspension reduced by an arbitrator. Specifically, although Major League Baseball and its teams generally have the legal right to punish players in this manner, Clevenger could argue that a suspension of this length is at odds with those handed down in similar, prior cases. Like any multi-billion dollar business, Major League Baseball is consistently defending itself from at least a handful of different lawsuits at any given time. And while we at FanGraphs attempt to keep you, the loyal reader, appraised of any major happenings in these cases, throughout the year a number of less noteworthy developments occur in these suits that, while potentially significant, nevertheless do not warrant a standalone write-up of their own. The purpose of this post is to update you on several such recent developments in two ongoing lawsuits against MLB, those challenging the league’s minor-league pay and fan-safety practices, respectively. Back in July, I discussed the significant victory that MLB secured in the litigation challenging its minor-league pay practices under federal and state minimum-wage law. Specifically, as I noted at the time, the court refused to certify the case as a class-action lawsuit due to several important differences between the work experiences of, and compensation received by, minor-league players. Given the significant setback that this decision represented for the minor-league players — removing more than 2,000 players from the case — it appeared inevitable that the plaintiffs would seek to have the decision overturned on appeal. Rather than immediately pursue an appeal to a higher court, however, the plaintiffs have instead opted to take a second crack at convincing the trial court to approve the case for class-action status. On Tuesday, we learned that Prince Fielder’s career has come to an end following his second major neck surgery in just the last three years. Jeff Sullivan provided a fitting eulogy for Fielder’s career a couple days ago. While the news is certainly devastating for Fielder on a personal level, this post concerns another matter — namely, the potential financial implications of Fielder’s injury, both for the Texas Rangers and Fielder himself. At the heart of the matter: the nine-year, $214 million contract Fielder signed in 2012, a deal that guarantees him another $24 million annually from 2017 through 2020. For starters, it’s important to note that Fielder is not officially retiring from baseball, but rather has been declared medically disabled and therefore is no longer considered to be physically able to play the game. This is an important distinction legally, because had Fielder voluntarily decided to retire, then he would have forfeited the roughly $104 million remaining on his contract. Instead, by being declared medically unable to play, Fielder remains entitled to the full amount he’s owed under his contract. Because Texas reportedly has an insurance policy covering his contract in the event of injury, the Rangers will not be on the hook for the entirety of the team’s remaining financial obligation to Fielder. Instead, the club will apparently only be responsible for paying Fielder $9 million per year from 2017 to 2020, with the rest of his salary covered by the team’s insurer (who will reportedly contribute another $9 million per year) and the Detroit Tigers (who are on the hook for the final $6 million per season, based on the terms of the trade that brought Fielder to Texas in exchange for Ian Kinsler in 2013). That having been said, although the precise terms of the Rangers’ insurance policy are not publicly available, it appears likely that this $9 million in cost savings will not come without some strings attached for the club. Moreover, it’s also possible that the team’s insurance company could still yet find a way to avoid paying some or all of its share of Fielder’s contract. Last October, the plaintiffs in the lawsuit challenging Major League Baseball’s minor-league pay practices scored an important, albeit preliminary, victory when the court tentatively certified the case as a collective-action lawsuit. As I noted at the time, this meant that rather than have to file individual lawsuits for every player allegedly denied the minimum wage or overtime, current and former minor-league players could instead opt-in to the existing litigation and have their claims against MLB tried together in the existing case (a much more efficient and less costly proposition). As I also noted at the time, however, this initial victory was potentially short-lived. Under the applicable legal rules, even though the court had preliminarily certified the minor leaguers’ case as a collective action, the court withheld a final judgment on the matter until after the parties had gathered more evidence regarding the extent to which the players’ legal claims were “similarly situated” to one another’s (i.e., whether the work experiences and legal claims of the plaintiffs already named in the lawsuit were roughly equivalent to those of the rest of the players who might join the case). That additional evidence has now been collected and, on Thursday evening, the judge in the minor-league wage lawsuit ruled that the plaintiffs had failed to show that their cases were similarly situated. Thus, the judge “decertified” the case as a collective action. This means that the roughly 2,200 current and former minor-league players who had joined the case since October have now been tossed back out of the lawsuit. These players must now instead file their own individual lawsuits against MLB should they wish to seek compensation for their alleged underpayment. Perhaps more importantly, Thursday’s ruling also dramatically lowers the odds that the existing lawsuit will force MLB to make significant, league-wide changes to its minor-league pay practices. Thus, the decision represents a major victory for the league in the minor-league wage litigation. After having been permanently suspended from baseball for performance-enhancing-drug use, relief pitcher Jenrry Mejia announced this past March that he would be challenging his suspension in court, insisting that he’d been wrongfully accused of using PEDs. Mejia even went so far as to hire an attorney, Vincent White, who levied some pretty serious accusations against Major League Baseball. In particular, White contended that he had discovered evidence that the league had illegally hacked into MLB players’ social-media accounts in order to obtain evidence of their PED usage. Despite the salacious nature of these allegations, Mejia has, to date, not yet elected to make good on his threat of filing suit against MLB. Mejia’s apparent unwillingness to sue hasn’t stopped his attorney from pursuing a case against the league, however. This past Monday, White sent out a press release announcing that he would file a new lawsuit against MLB on Thursday, a case that he claimed was based on a “multi year investigation” that would bring to light “corrupt mob-like activity” by the league. Rather than filing the suit on behalf of Mejia, however, it turns out that White is instead representing Neiman Nix, a former 29th-round draft pick of the Cincinnati Reds, who went on to establish both his own baseball training academy, as well as an anti-aging clinic, in Florida. Nix contends that MLB intentionally interfered with both of these business endeavors, perhaps most notably by subjecting his anti-aging clinic to many of the same, allegedly unsavory investigation techniques that the league used during the midst of the Biogenesis scandal. Nix’s lawsuit thus seeks to hold the league legally responsible for his resulting financial losses. As has become customary, both Major League Baseball Commissioner Rob Manfred and Tony Clark, head of the Major League Baseball Players Association, held press conferences during All-Star week to field questions regarding various issues affecting the game. Unsurprisingly, one of the issues about which both men were asked concerned the ongoing litigation over the allegedly illegally low wages paid to minor-league players. To some extent, both Manfred and Clark expressed fair and legitimate concerns regarding the issue. At the same time, however, further examination reveals that both statements appear to be somewhat disingenuous.